Best Deal In La Rocca. Atrium is gone and an oversized den/office complements this wonderful 3 bedroom 3 bathroom home. 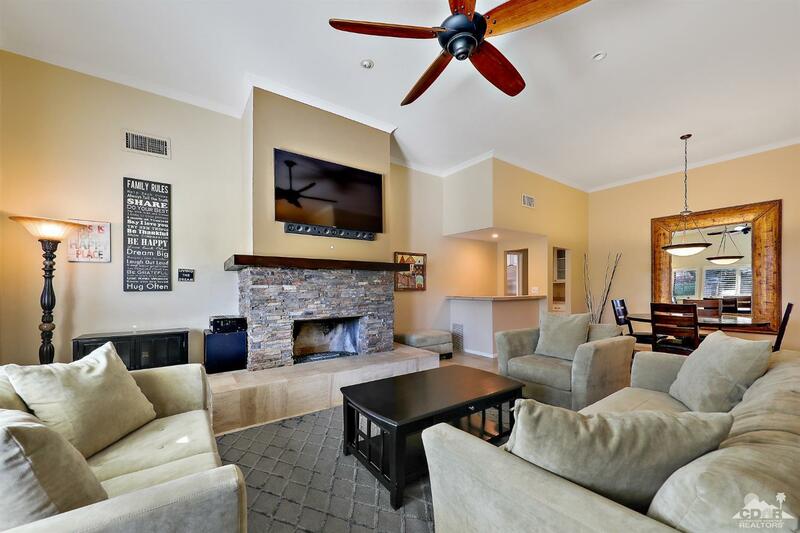 Relax in the living room with a beautiful cozy re-modeled fireplace, entertain with the wet bar and fabulous patio added off the front living room. Rear patio has a wonderful pergola for a great outdoor space. High ceilings and sky lights make this home light and bright. The spacious master bedroom has large walk-in closet. Both guest bedrooms are en suite. New A/C in 2018. Partially furnished as per the inventory list. La Rocca offers a 9 hole pitch and putt golf course, 6 pools/spas, tennis courts and a pickle ball court plus you receive Indian Wells Resident benefits. Fitness at the Hyatt, spa and food discounts and tennis tournament tickets to name a few. Included in Sale: Partially furnished as per inventory list.